This is a story of some toys that used to belong to a little girl with brown curly hair and glasses. Then one day, they got put away in a box, where they sadly stayed for 21 years. The girl moved far away for a long time, and soon grew into a woman. The woman eventually got married and had two children of her own. Today is the the day that the toys finally got rescued from the box and were played with again by the girl’s daughter. 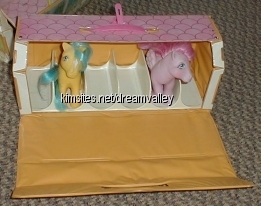 Today we found a box of my old My Little Ponies, Barbies, and dolls from childhood. These are the only toys I have left! They were my favorites. Madeleine was thrilled to add a ton of Ponies, Barbies, and Barbie clothes (some sewn by my great-grandmother) to her collections. I started counting and could not believe it had been over 20 years since those toys have been played with!!!! I’m getting old!